Painting and Fashion, perfect mix. 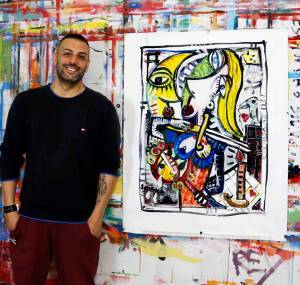 During the painting exhibition by Alessandro Siviglia, which took place in Rome at the palazzo velli in Trastevere from June 29th to July 1st, Seville welcomed stylist Gabriella Bolero at her expo (fashion designer). Here the artist painting exhibition Alessandro Siviglia meets fashion, in fact the location with the artist’s paintings were chosen to create some shots made by Tatiana Ugazio, photos taken by the model who wore the clothes created by Gabriella Bolero. Here are some shots taken during the exhibition of paintings by Alessandro Siviglia at the Palazzo Velli in Rome.